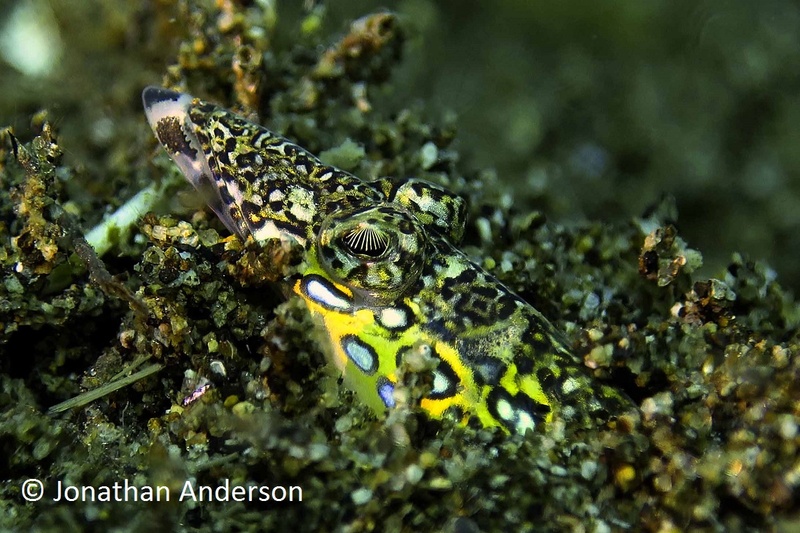 We still have much to understand about how Critters view their home under the waves. Some eyeball designs suggest they see the world much as we do, whilst others suggest super-hero-like vision. Let’s focus (bad pun) on Critter Vision. 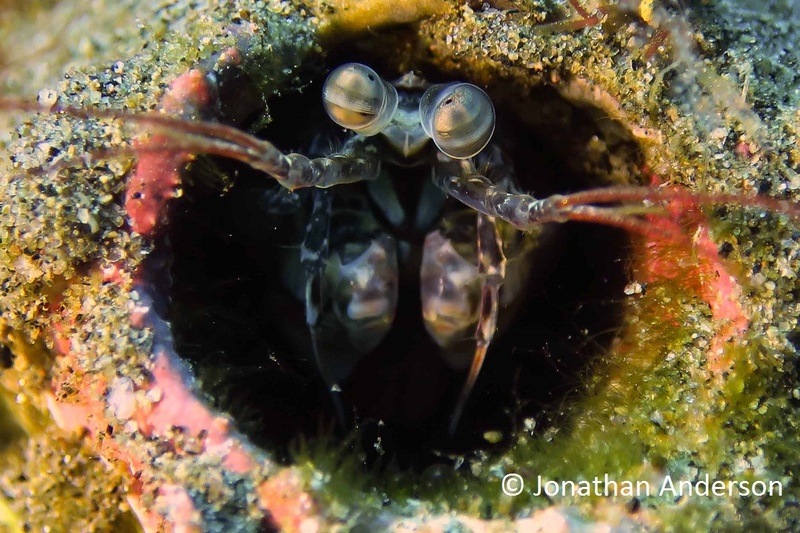 The Mantis Shrimp has reportedly the most complex eyes of any creature on Earth. While we humans have to cope with 3 colour receptor types, their compound vision has no less than 12 receptor types, causing some the wonder at just what the world looks like to a Mantis Shrimp. 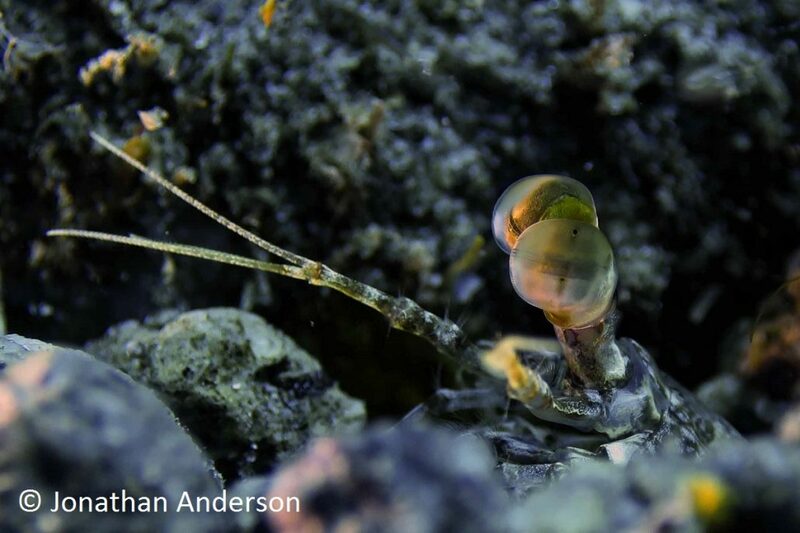 Whilst their vision is undoubtedly sophisticated – each eyeball processes its own information supporting lightning-fast attacks – recent studies on Mantis Shrimps trained to react to different colours suggests that their ability to tell the difference between visible spectrum colours like red and orange is no better than ours. In fact, we can distinguish between a much finer distinction of colours than a Mantis, so you better not trust this guy to help you pick out a party outfit. The Black-Saddled Toby has an eye that at first glance suggests human-like visual capabilities. There’s an iris, a black circular pupil, a lens, etc. However, the eyeball is much more spherical than ours, which allows the Toby to gather more light and information from a much wider field of view. The lens also isn’t stretched or squashed to focus on the retina like ours; rather it moves backwards and forwards rather like the focusing elements of a telescope. Pretty clever stuff for such a little guy, but then they need sharp vision to spot potential predators. The Toby does have a secret weapon though – they are members of the Puffer family, carrying some odorous toxins on their skin which serve as a very effective deterrent to unwanted attentions. We all know someone like that. The Painted Frogfish doesn’t have great eyesight. It doesn’t really have to see beyond the lure it dangles in front of its cavernous mouth. 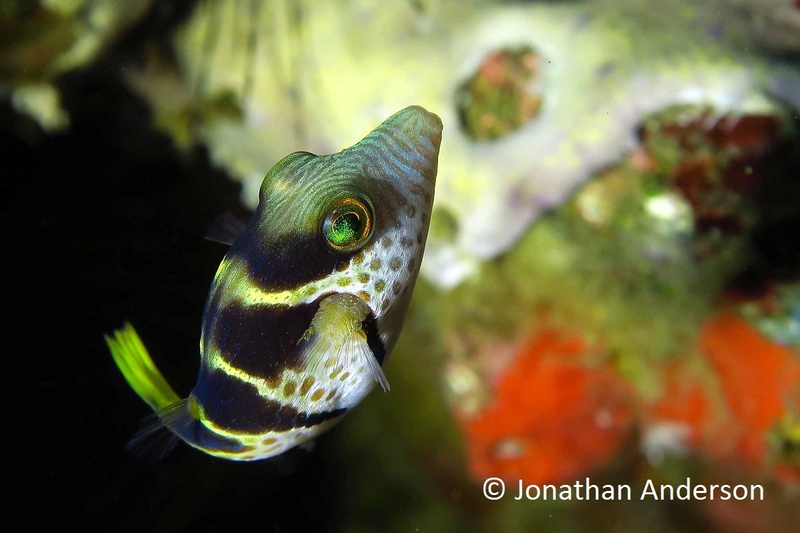 Just like humans, fish concentrate on eyes, as they expect a mouth to be nearby, which is a place they probably don’t want to go. 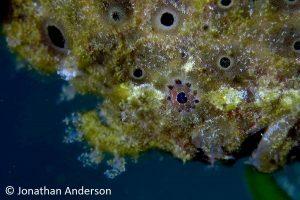 The Frogfish distracts would-be dinners from making that connection by having many other false eyes dotted around its body (called ocelli), and by extending the patterns surrounding its eye onto the eyeball itself. For more fascinating facts about Froggies, look up CritterWatch post number 6 – Frogfish Chorus. The Black-Banded Flathead buries itself in the sand, leaving just its eyes and mouth above the surface. It feeds on passing tiny fish by exploding upwards with a gaping mouth, having spotted them with its excellent binocular vision. Research has shown that many fish can see a much broader spectrum of light than us, including infrared (night vision) and ultraviolet light. To make these large orbs appear less obvious above the sand, the iris is streaked with thin lappets, which help break up the outline of the eye and allow the Flathead to hide in plain view. Cuttlefish have a very distinctive W-shape pupil when in bright light in the shallows, which changes to a regular round pupil in poorer light conditions. 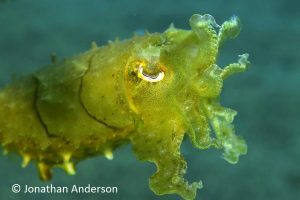 Research suggests the W-shape pupil reduces distracting and uneven shadowing allowing the Cuttlefish to more easily distinguish prey, and predators. Having a very squishy body also allows the Cuttlefish to move its eyes about, adopting a wide-apart stance when observing its surroundings and detecting threats, or bringing them closer together and facing forwards when in attack mode. They can also see polarised light, which is thought to allow it to communicate through colours and patterns invisible to other organisms – check out CritterWatch post number 9 – Cuttlefish Chameleons – to learn more about these amazing Critters.